A golf ball dispenser which attaches to the exterior surface of a golf bag that is upright, rectangular, and capable of holding a plurality of golf balls, is herein disclosed. The dispenser is made of a durable yet flexible plastic material. Stored balls are added through the top of the dispenser through an upper opening. The balls can either be inserted one (1) at a time or in "as-purchased" quantities. In use, to remove a golf ball, the lowest ball is forced upward through a flexible retaining tab, thus releasing the ball through a bottom aperture. The dispenser is attachable to a golf bag with a fastening means. See the youtube video attached for a visual understanding of the product. For many casual golfers, a good day on the course is directly related to how many golf balls they loose or find. Additionally, many golfers prefer to use cheaper balls when teeing off, around water hazards, or for other shots where the likely hood of loosing the golf ball is increased; keeping the better golf balls for situations where precision and accuracy is of the utmost importance, such as chip shots and putting. This practice usually requires a golfer to fumble through a golf bag searching for the ball of choice or keeping multiple balls in their pockets during the game, which is inconvenient and uncomfortable. A variety of attempts have been made to overcome these disadvantages and provide a means to contain and dispense a plurality of golf balls in a convenient and efficient manner. These attempts include various tubular golf ball holders where the golf balls are vertically stacked and dispensed one at a time from a golf ball holder housing during game play, practice, or the like when a ball needs to be replaced. The attempts typically encounter various disadvantages including: inconvenient and restrictive methods of mounting or carrying the holder, cumbersome mechanisms used to retain and dispense the balls, dispensing mechanisms that oppose the force being exerted by the stacking of balls within the holder often causing the dispensing means to malfunction, the inability to determine how many if any balls are actually stored within the holder, or multiple components that require a user to assembly the holder to manipulate parts when a golf ball is to be inserted or removed. 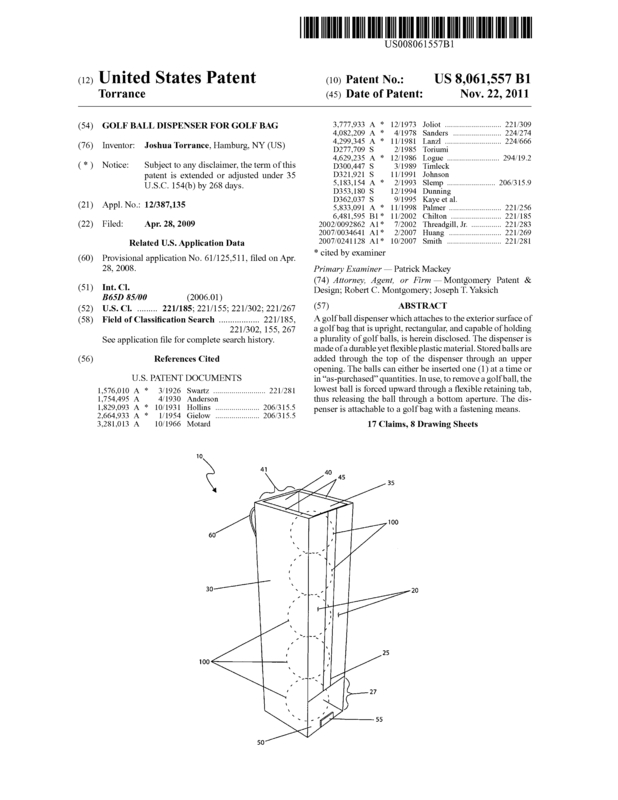 Page created at 2019-04-25 14:24:42, Patent Auction Time.